The numbers of unemployed have been falling now for a over a year, and it certainly seems that Britain is back on the path to prosperity. Earlier this month, it was reported by the Office for National Statistics that the unemployment rate had reached 6.9%, which is the lowest recorded point that it has been since the start of the recession. With the statistics showing record employment, and that at any given time there are 600,000 vacancies in the UK, new stringent measures will take place that will affect those who have been on unemployment benefits for over two years, called Help to Work. Failure to comply to any of these new standards will result in suspension of the person’s Job-Seeker Allowance (JSA) – a month for the first offence, and 3 months for the second. One major change will make it mandatory for claimants to meet with a supervisor at a Job Centre every single day, rather than every fortnight to try to quicken the process of getting them jobs. There will be intensive training sessions also included, to make sure that all claimants for JSA have all fundamental skills needed for any job, such as basic literary skills, simple maths, and basic knowledge of computers and sending e-mails. If coming in to a Job Centre every day is not a viable option, then the person must commit to six-months community service, with 30 hours being done each week in addition to job-seeking. This could include gardening projects, working in community cafes, helping the elderly/disabled, or restoring historical sites and war memorials. The objective of this process is that this would teach the people discipline of holding office hours, and how to work as part of a team. However, this part of the new scheme has been met with a massive amount of resistance from volunteer organizations, such as The Salvation Army, Oxfam, and YMCA. They have started a campaign called “Keep Volunteering Voluntary”, calling this “workfare”, and saying that this forced work will only warp the true spirit of volunteering. In general, it is worried that these strict measures will only get people off benefits, but not necessarily find them paid work. 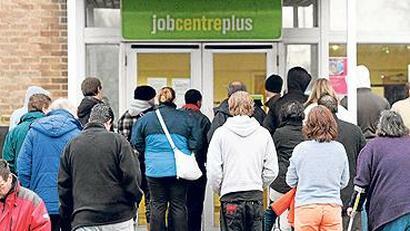 What do you think – will this benefit those who are long-term unemployed, or will it hinder their process? Find Jobs Online in the UK now with Strike-Jobs.co.uk ! This entry was posted in General Posts and tagged david cameron, Help to Work, Job Centre, Job Centre Plus, Job Market, JSA, Oxfam, Prime Minister, The Salvation Army, UK Job Market, UK Unemployment, Volunteer Work, Volunteering, Workfare, YMCA. Bookmark the permalink.